We have the winners! Thanks for everyone for participating. It was a close contest. With some surprising twists and turns during the tournament, both Coach Michael Dixon and Jough Niemchak came out on top. They are pictured with Coach Craig Williams receiving their awards. 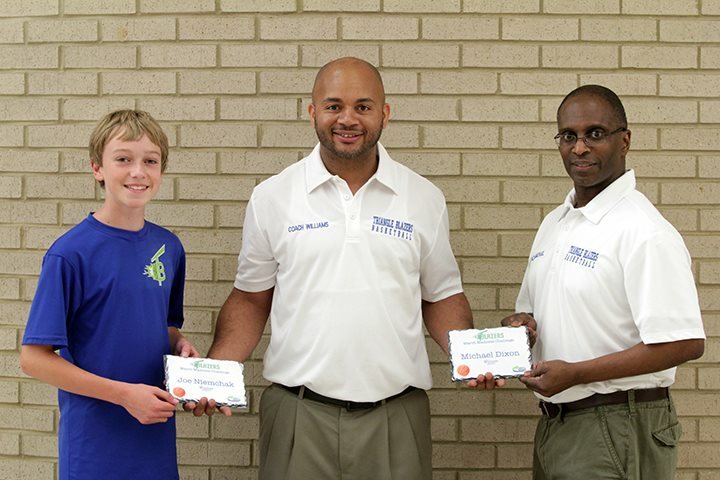 Winners of the Triangle Blazers NCAA Tournament Bracket Challenge 2013 are pictured receiving their awards. They are Jough Niemchak, athelete winner, Coach Craig Williams (President of the Club), and coach winner Coach Michael Dixon. The Triangle Blazers Basketball Club is challenging you to play Tournament Challenge on ESPN.com! A special prize will be awarded by our President Coach Craig to the winners. Get in on the excitement of this year’s NCAA Men’s Basketball Tournament. Compete against other fans as you fill out a bracket and earn points for every correct pick! Come out on top and you could win a $10,000 Best Buy gift card. Get a group together and earn plenty of bragging rights among your friends by winning it all. Best of all, it’s free to play and win. March 10, 2013 in Archive, Triangle AAU Basketball.